Thinking of converting your entire fleet to zero-emission, all-electric Battery Electric Vehicles (BEVs)? If so, according to the Canadian telematics company Geotab, the process has three distinct phases, each of which is marked by a distinct set of management considerations and optimized by using data fleets can best obtain from a fleet-wide telematics system. That was the message fleet professionals heard from Steffano Peduzzi, Geotab’s European director of engineering at the Great British Fleet Event in London earlier this year, where fleet electrification was a major topic of discussion. According to Peduzzi, the first phase of fleet electrification begins when fleet managers decide to add electrified vehicles to their fleets. Peduzzi refers to this stage as “going electric” and applies to the first 30 percent of a fleet’s transition to full electrification. At this point, fleet managers need know two things about any vehicle they are considering replacing with an electric vehicle: your vehicle’s required daily maximum range and its total cost of ownership (TCO). Range: According to Peduzzi, any BEV under consideration should be disqualified if its battery it isn’t capable of delivering the same required daily range of the fossil fuel-powered vehicle you’re thinking of replacing. One the one hand, if the BEV’s range far greater than the maximum you need, that might also be grounds for disqualification because of the high price of the long-range battery. On the other hand if the range you need is greater than that offered by the longest-range BEV available, a plug-in hybrid (PHEV) might be the better alternative, given its lower acquisition cost. TCO: The second question fleet managers need to ask is: what is the current vehicle’s total cost of ownership? 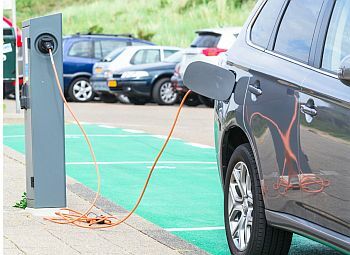 Knowing this will enable fleet managers to compare the total cost of their current fleet with forecasts of the total cost of ownership of electric vehicles under consideration to identify areas in which electric vehicles offer the opportunity for breaking even financially, or of reducing fleet costs. Forecasts and the resulting cost comparison involve guesswork, but the idea is to make that guesswork as informed by empirical data as possible. As these considerations have been made, the next phase of fleet electrification, which Peduzzi calls “operating electric “also begins and lasts through the entire transition process. In this stage, fleet managers need to focus on keeping EVs operating in a way that takes the greatest possible advantage of EV’s natural advantage over their ICEV counterparts – their lower operating costs – in order to offset their disadvantage of higher purchasing price. To this end, Peduzzi sees a major role for a whole range of telematics data particularly tailored to the operating characteristics of EVs and PHEVs. • Reporting on EV “fuel efficiency” (kWh per mile), which enables fuel efficiency comparisons across vehicles which can highlight areas where changes in driver behavior can bring about an improvement (and also improve their driving safety, which also reduces costs). • Fuel and energy economy figures for PHEVs (in MPG-equivalents, MPG, and kWh/mile). These can be used to calculate greenhouse gas emissions, determine whether PHEVs are being operated in a cost-optimizing manner that takes full advantage of their electric ranges, and highlight if there are potential recharging compliance issues that need to be addressed. • Off-duty location data showing where vehicles are when they’re not in use. This data is indispensable to helping fleet managers decide where and how much recharging infrastructure to install to ensure that vehicles’ batteries are always being brought back to a full charge whenever they’re idle, reducing the potential for downtime. • Reporting on fleet-wide recharging patterns that can highlight possible opportunities for fleet managers to take the greatest possible advantage of lower off-peak electricity rates without compromising fleet reliability. • Real-time electric vehicle level of charge data. This information adds another way to ensure recharging compliance and enables pooled vehicles to be allocated on short notice based on their level of charge and the distances that need to be covered. Such data also and it enables vehicles to be assigned priority for recharging, so that those with the lowest state of charge (SOC) are recharged first. With each of these pieces of information, fleet managers will have a more complete statistical profile of their fleets over a range of timescale that will help them to operate their fleets less like an assemblage of individual disconnected vehicles and more like a fully harmonized, highly flexible transportation system. Peduzzi’s third phase, which he calls “smart charging,” applies to the latter 70 percent of fleet electrification. This phase aims at dynamically managing when and where vehicles are charged so that the fleet optimizes vehicle capacity utilization while minimizing what it spends on electricity to power them. The primary considerations in this phase include the number, location and types of recharging stations as well as knowing when electricity rates are at their highest and lowest throughout the day and the season of the year. For example, if too many EVs are charged in a given location at the same time, the result may be purchasing at times of peak rates, or a local grid overload that can lead to power interruption or damage to transformers. Peduzzi said using telematics data can help fleet managers avoid these problem by enabling them to identify patterns in the time of day their EVs make peak demand on the grid and then shifting it instead to the locations or the times of the day when electric power demand is lower.